Healthy and hydrated skin is always top of my wish list, so I thought I would share a few of my fool-proof skincare products that keep my skin in its best condition. Lets start off with the Elemis Pro-Radiance Illuminating Flash Balm which is a multi-tasking marvel. Designed to brighten and protect against moisture loss this balm always ensures that I wake-up with radiant and hydrated skin. I tend to apply this particular cream in the evening to give it time to work its magic, but it can actually be used as a daily moisturiser, radiance booster or make-up primer due to its light non-sticky texture. Next up we have the Clinique Moisture Surge Extended Thirst Relief which is my go to daily moisturiser. I love how easily it absorbs into my skin and its cream gel formulation makes the skin feel amazing. It is designed to offer the skin a full 25 hours of moisture and I well believe that statement, as my skin remains comfortable right throughout the day and night. I never have to deal with tight, flaky or uncomfortable skin as long as I'm using this. Moving onto what might be the BEST skincare bargain EVER! For just £2.69 you get 50ml of skincare magic. The Superdrug Simply Pure Hydrating Serum is enriched with calming soothex and a fortifying Cermaide Blend (Proven natural actives), this is a super hydrating fuss free product that does exactly what it says. It has knocked all of my other far more expensive serums to one side. Last but not least my favourite evening serum and probably one of the biggest cult skincare products known! The Estee Lauder Advanced Night Repair is a proven product to help keep your skin beautiful and hydrated, as well as reducing key signs of ageing. It works its magic through the night with the Estee Lauder exclusive ChronoluxCB Technology. So there we have it lovelies! 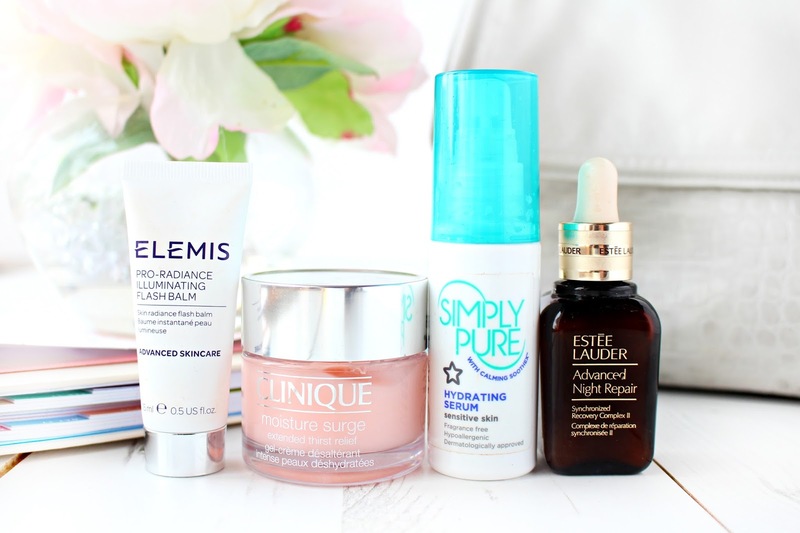 My absolute favourite products that help to keep my skin feeling and looking hydrated. Don't forget to share your favourites too, as I'm always on the look out for new products to try! I find my skin always takes a hit during these colder months and some of these products sound amazing!! I have to check out the Superdrug serum, such a bargain and I need anything to help me with my dry skin at the moment- makes my makeup a nightmare!